Mokwa bridge collapse: We did not study the bridge – Agency – Royal Times of Nigeria. The Nigerian Building and Road Research Institute (NBRRI) has confessed that they did not foresee or study the Mokwa bridge before its collapse. 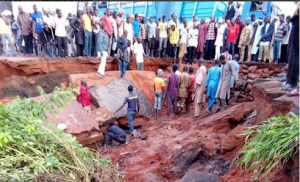 The agency under the Federal Ministry of Science and Technology said that entire bridges around the area are low line and with a kind of soil that is collapsible, which needs to be revisited. 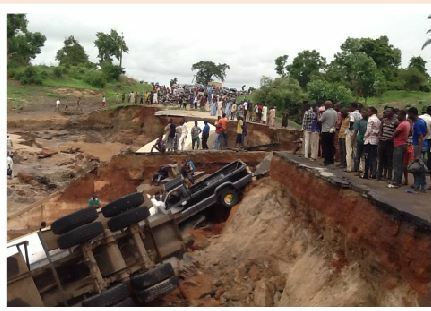 Director General NBRRI, Prof. Danladi Matawal revealed that their has been the reoccurance of collapse of bridges both road, railway and culvert around Mouka area because of the terrain of the area. Prof. Matawal said, “Their has been the re-occurrence of collapse of bridges both road, railway and culvert around Mouka area because of the terrain, their was the need to adequately design to contain extreme flooding situations and I think that the design probably did not take proper consideration of this. “I know we visited about a year ago, two, three collapsed sites in the same environment and it is unfortunate it has re-occurred this year. I think the entire bridges around the area which are low line and with a kind of soil that is collapsible needs to be revisited. “I am not sure if it is the same bridge that collapsed but I think after the initial construction, we did not foresee the current collapse because we did not study that particular bridge. Minister of Science and Technology Dr Ogbonnaya Onu said that his ministry will support NBRRI in embarking on necessary reasearches.